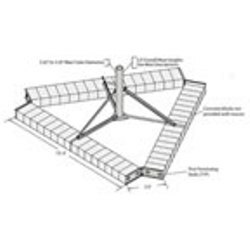 This non penetrating roof mount is capable of supporting dishes up to 6' in diameter for PCS, wireless, cable, DBS satellite and UHF/VHF reception depending on wind and Ballast load (see details). The base of the roof mount is 10.5’ triangular using 48 standard concrete blocks used as ballast to form the base. The base hardware and mast pipe are Hot dip galvanized for corrosion protection and goes together quickly.